246 pages | 74 B/W Illus. 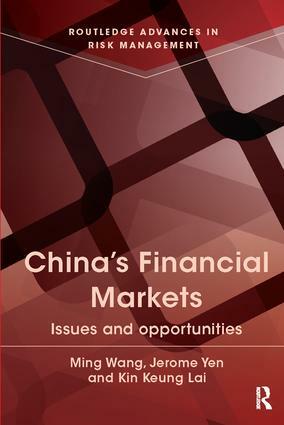 This book provides an overview of China’s financial markets and their latest developments. The book explores and discusses the difficulties in building modern financial markets that are compatible with an increasingly complicated market economy and examines the various strategies to reform China’s financial system. It covers a range of topics: China’s financial structure, financial regulation, financial repression and liberalization, monetary policy and the People's Bank of China, banking reforms, exchange rate policy, capital control and capital-account liberalization, and development of the stock markets. The book provides a basic understanding of the current issues related to the development of China’s financial markets. It enhances knowledge of China’s regulatory framework which has helped to shape China’s financial landscape. It provides specific, useful knowledge about investment in China, such as, market sense, to identify the investment opportunities in various asset classes. Ming WANG is currently Assistant Professor of Tung Wah College, Hong Kong. Dr. WANG received his two Ph.D. at City University of Hong Kong and University of Science and Technology of China. He has been Postdoctoral fellow at Center for Transport, Trade and Financial studies, City University before joining Tung Wah College. Jerome Yen is currently a Professor of the College of Business at Tung Wah College, Hong Kong and also a visiting professor in the Department of Finance at Hong Kong University of Science and Technology. He is also the director of HKUST’s Quantitative Finance program where over seventy percent of graduates went to investment banks like Goldman Sachs and Morgan Stanley. He received his PhD in 1992 in Systems Engineering and Management Information Systems from the University of Arizona. His PhD research was conducted in the Economic Science Lab at the University of Arizona, led by Prof. Vernon Smith – a Nobel Laureate. Kin Keung Lai received his PhD at Michigan State University, USA. He is currently the Chair Professor of Management Science at the City University of Hong Kong. He is also the Director of the Invesco-Great Wall Research Unit on Risk Analysis and Business Intelligence (RABI) at the College of Business. He is the editor-in-chief of the International Journal of Computational Science, International Journal of Optimization: Theory, Methods and Applications and International Journal of Operations Research.